Leaving Manila in behind, me and my three travelling companions – James, Chloe and Pedro – made our way to the bus station, where were loaded upon an aged vehicle. Once every space was filled, extra chairs were assembled in the aisle and more passengers were loaded on. This kind of thing is generally the norm in Asia, if you are travelling during the day, but this was night and… wasn’t this service advertised as a ‘sleeper’? Ohayami are certainly not a company I would recommend to future travellers. As the bus drove out of the city, engine straining from the weight of over 60 passengers, I discovered that my seat didn’t recline, and accepted the fact that sleep was going to be near impossible that night. 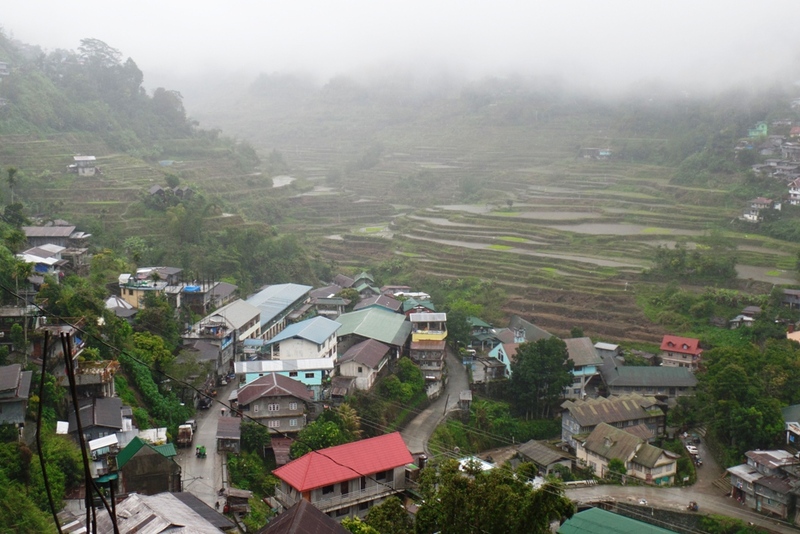 Banaue is a mountain town in the highlands of North Luzon. 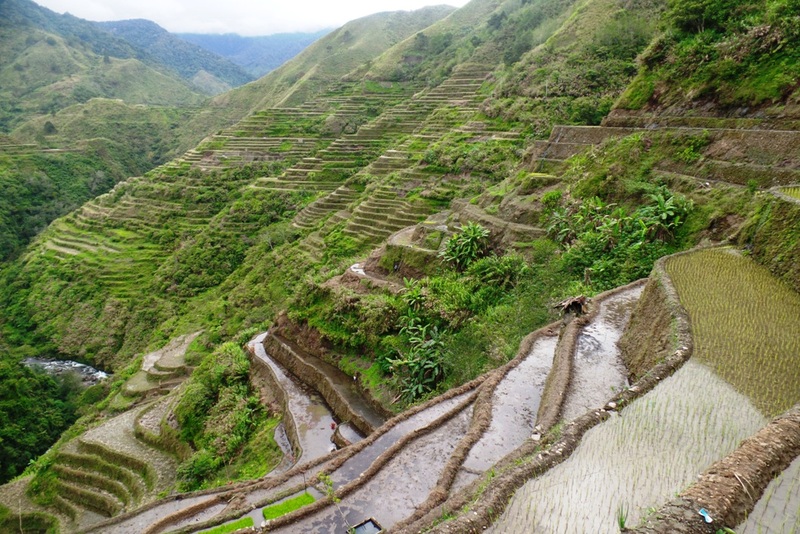 It is the gateway to the Ifugao Rice Terraces; an ancient complex of paddies spread across the Philippine Cordillera which archaeological evidence suggests are over 2,000 years old. 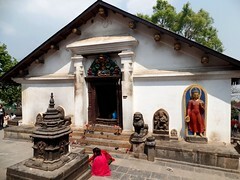 In 1995 the area was awarded the status of a UNESCO World Heritage Site. 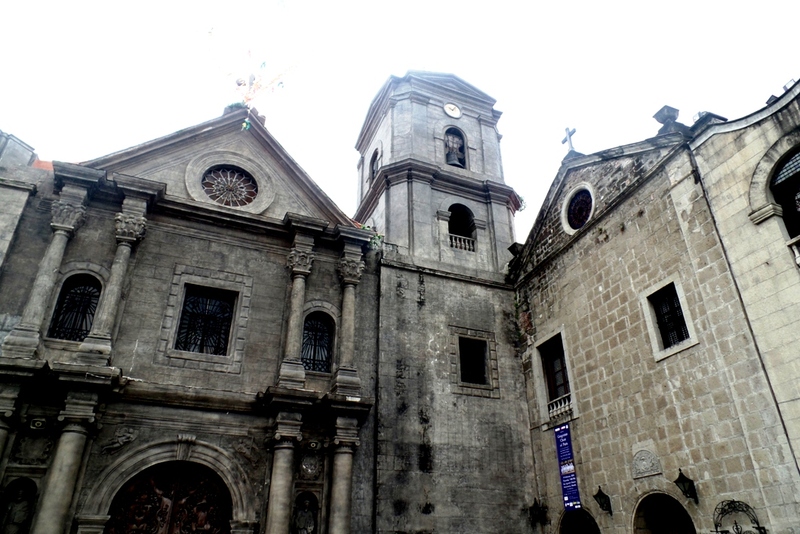 It was one of the places which had originally inspired me to come to the Philippines. 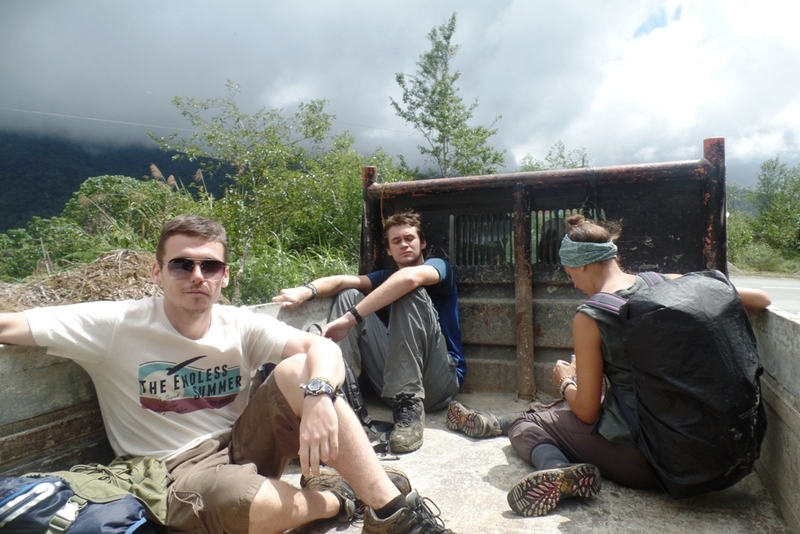 When we arrived in the morning it was raining and we were very tired, so we resigned ourselves to a lazy first day. 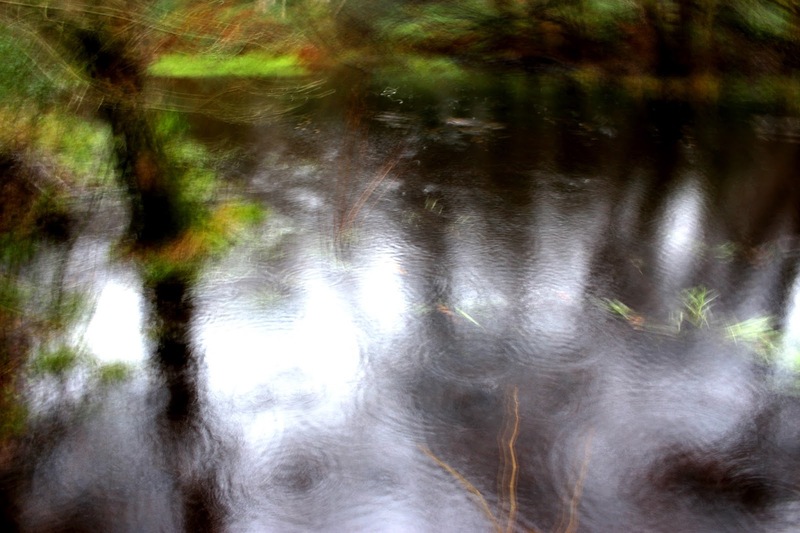 We settled into a nice guest house called Querencia Hotel, which had restaurant overlooking the mountains, and we relaxed, occasionally turning our eyes wistfully to the window, where the downpour seemed to carry on relentless. It eventually cleared up for a while, and during this brief lapse we ventured outside and made our way over to a local viewpoint, where we caught sight of mist drifting across the valley, blocking much of the scenery from view but making for an atmospheric landscape. 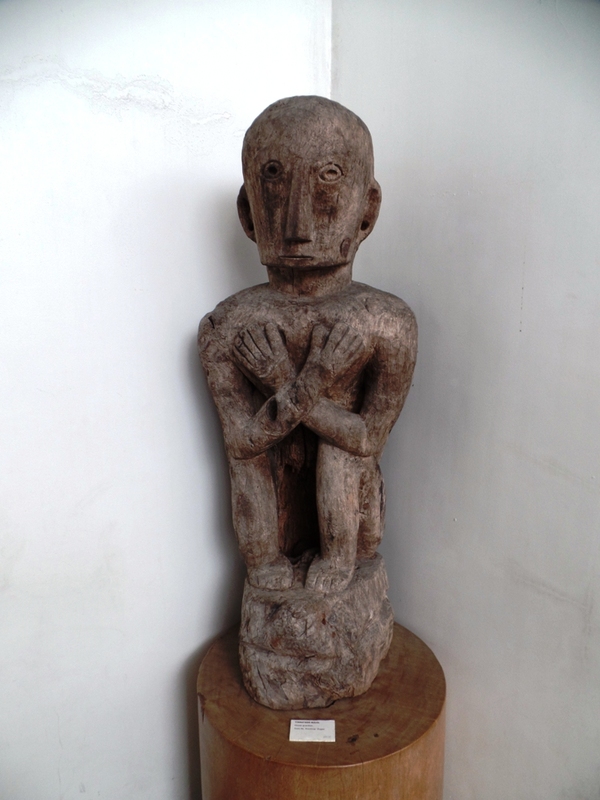 We then wandered over to a nearby museum, which was filled with artefacts and had lots of information about the culture and history of the Ifugao tribes who call these lands home. After a good night’s sleep – and much improved weather – the following morning we were ready to start exploring the area properly. 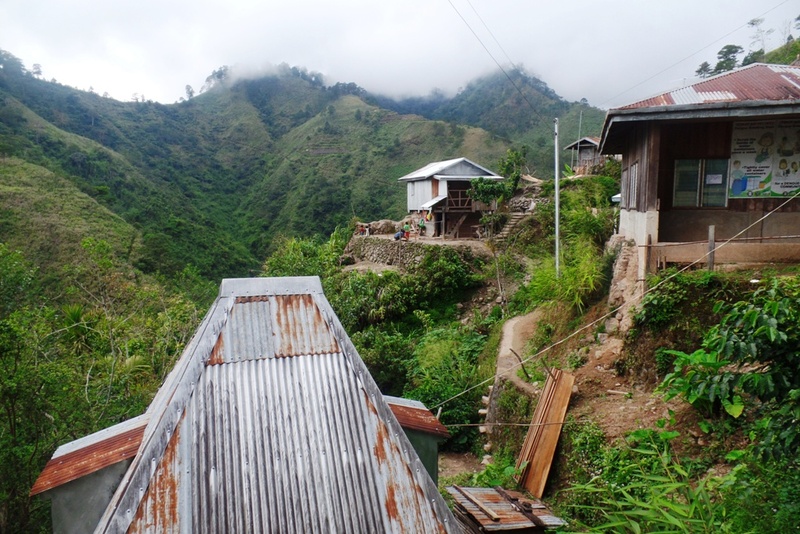 We went for a wander along a trail which followed an old irrigation canal through some of the rice fields outside Banaue, passing Tam-an – a humbly picturesque village – and then Poitan, which had some traditional Ifuago huts. We then returned to Querenia Hotel and packed our bags before jumping upon a jeepney heading to Batad. We had ideas in our minds of venturing out on a trek from there so we could see some of the terraces and villages which are a bit more off the beaten track. By a stroke of fortune we met a woman on the jeepney called Joy who was a registered guide. She was from Batad and spoke very good English, so we told her that we were interested in hiring her to take us out on a trek the next day if the weather was agreeable. 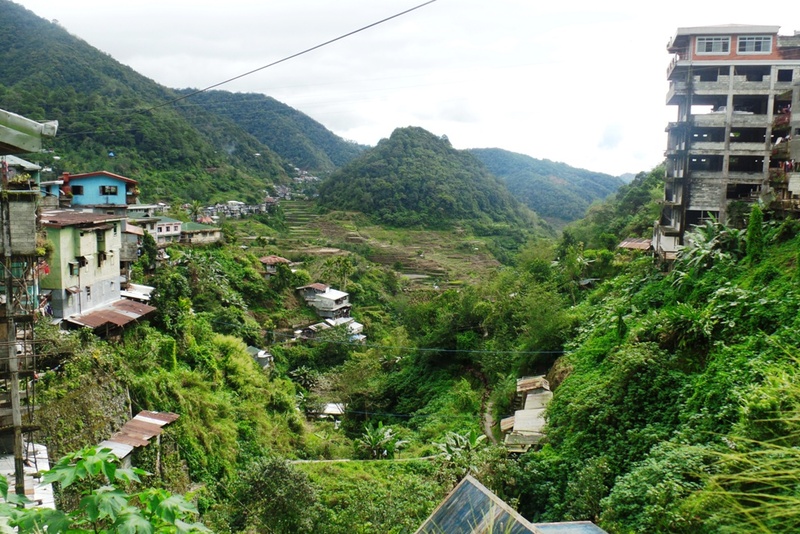 Batad isn’t properly joined up to any roads so we had to get off the jeepney and walk the last few kilometres. 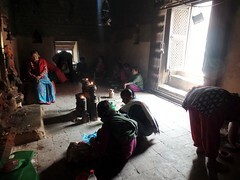 We managed to make it to the village in time to see its breathtaking terraces before the sun went down, and then we claimed a dormitory-style room in a simple lodging house. It rained all night, and when we got up the next morning the entire village was so enveloped by fog that all we could see from the balcony was white. We began to worry that we were going to have to rethink our plans to venture out on a trek that day, but luckily the haze gradually lifted and the sun came out. We contacted Joy and told her that we could be ready to leave within a few minutes if she was still free to take us. Shortly after that, she was leading us out of the village through the terraces. Along the way she told us lots of interesting facts about the area and its people, and she was also happy to do her best to answer any questions we had. All but 2% of the people living around Batad have converted to Christianity, but some of their old summer festivals are still in practice, and she was able to tell me that the wooden effigies of a sitting man I kept seeing everywhere were depictions of Bulul, who, back in the days when they were animists, was placed around the fields to guard the rice. 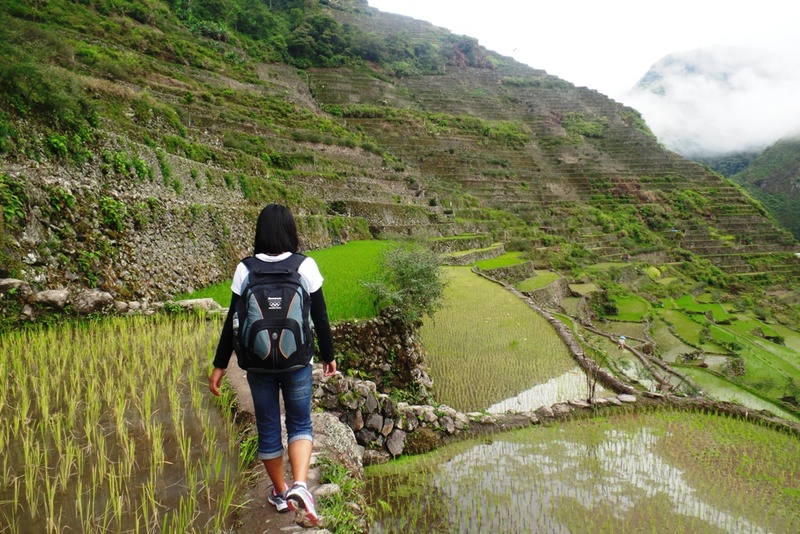 Once we had crossed the Batad terraces Joy led us over a mountain and through some woodlands. At around midday we reached a village called Cambulo, where we ate lunch, and then for the rest of the day we were hiking along a ravine with very striking scenery. Later that afternoon we reach Pula, a small village perched upon one of the mountain peaks. It only had one guesthouse, which was owned by an elderly lady whom everyone called “Aunty”. There was a French couple also staying there that night, and their guide and ours worked together to rustle up some vegetables and rice for dinner. While they were cooking Aunty’s grandson, Marvin, chatted with us about his life growing up in the terraces and his plans to get a job abroad for a while to improve his English. When we had finished eating we all sat around a fire and Marvin initiated a few puzzle games. In the morning we rose bright and early. We were all keen to get going, as we were hoping to get back to Banaue by lunchtime so we could catch the midday bus heading to Sagada. 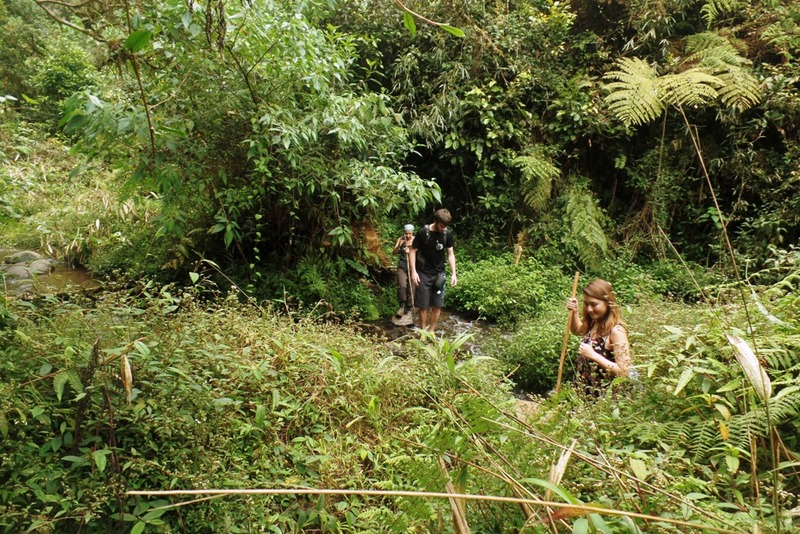 We were accompanied by the French couple and their guide for the remainder of our journey as we walked for four hours through a terrain of forests until we reached the main road. Once there, we thumbed a passing dumpster-truck and jumped onto the back. 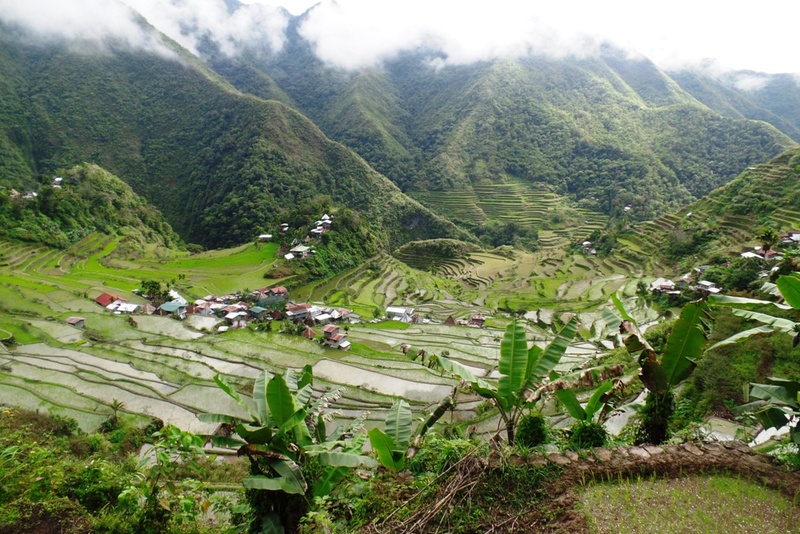 For more photos from the Ifugao Rice Terraces, click here. My travel-buddy James also has his own photography website. If you are interested in embarking upon a trek around the area with Joy (whom I would highly recommend as a guide) then she can be contacted via email (jpoligon@yahoo.com) or her telephone number (+639366580357). Manila has a bad reputation among the capitals of South East Asia: crime levels are high, it is surrounded by shanty towns, the streets are dirty, the traffic is almost constantly congested, the air quality is poor, and some say it gives even Bangkok a run for its money for seediness. 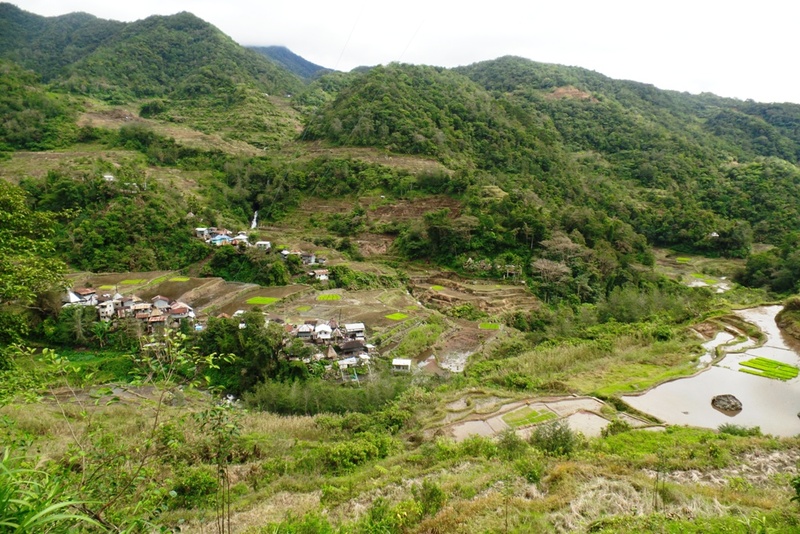 It is the sort of place which I usually avoid, but I was going to have to pass through there on my way to the Ifugao Rice Terraces from Donsol anyway, and making that journey all in one go would have meant spending a full 24 four hours on buses. 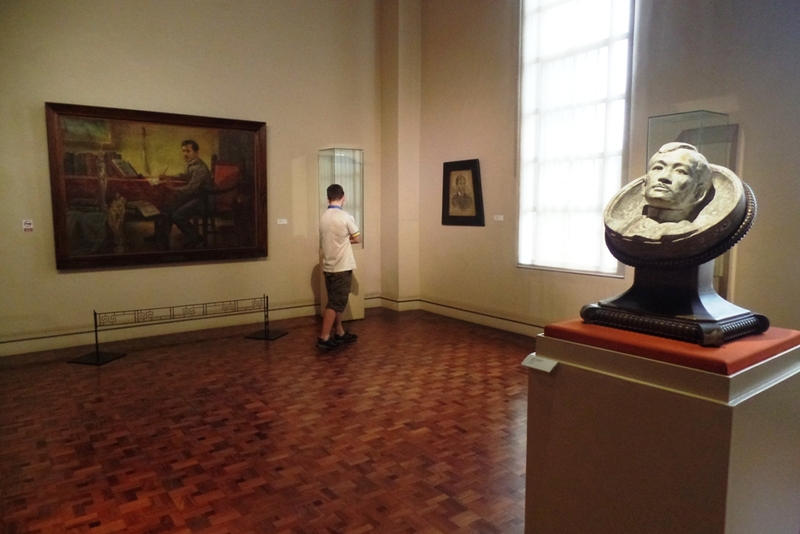 It was Manila’s rich abundance of museums which eventually swayed the decision for me and my three travel companions – Chloe, James and Pedro. 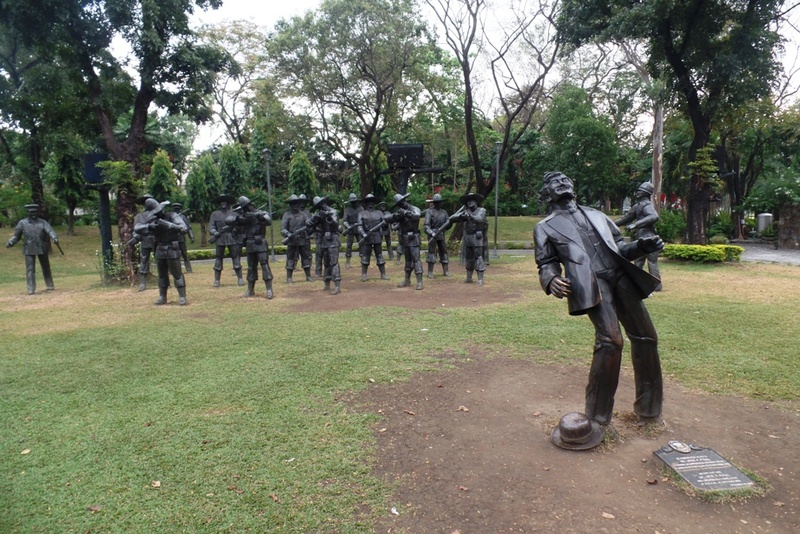 Rizal Park seemed like a good place to begin our cultural experience of Manila. 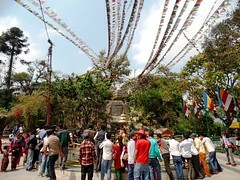 It was just a short walk from our hotel and contained many mini-attractions. 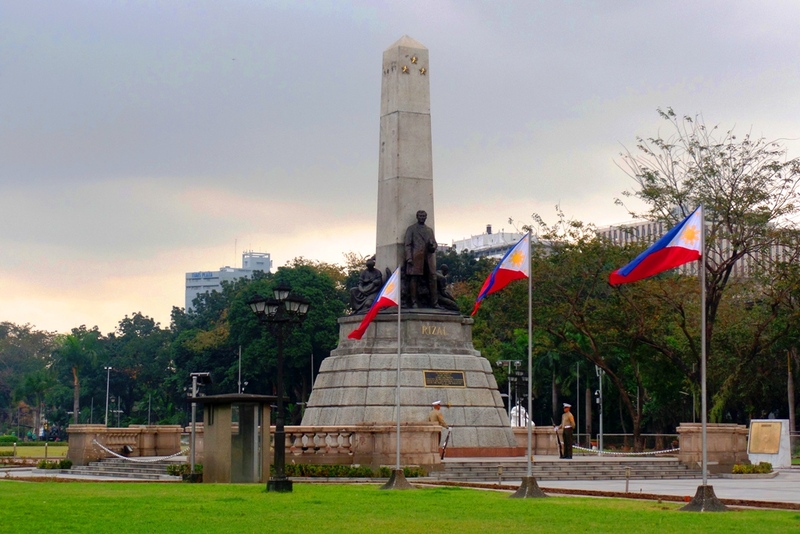 After a quick stroll through the central gardens we passed Rizal Monument – where the national hero’s remains are kept under guard by armed sentries. 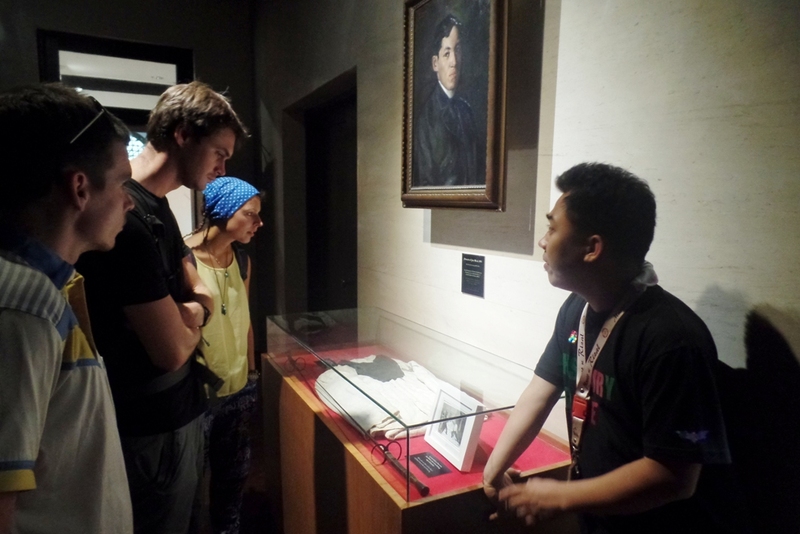 And, when we visited Fort Santiago, we discovered it was the location where Rizal was imprisoned before he was executed and, thus, part of it had been converted into a shrine and museum about his life and works – of which, we were given a complimentary guided tour. By the end of our first afternoon in Manila, we were feeling like we had learned quite a lot about the national hero of the Philippines, and he sounded like a very admirable man. There was much more to Manila than José Rizal, though. 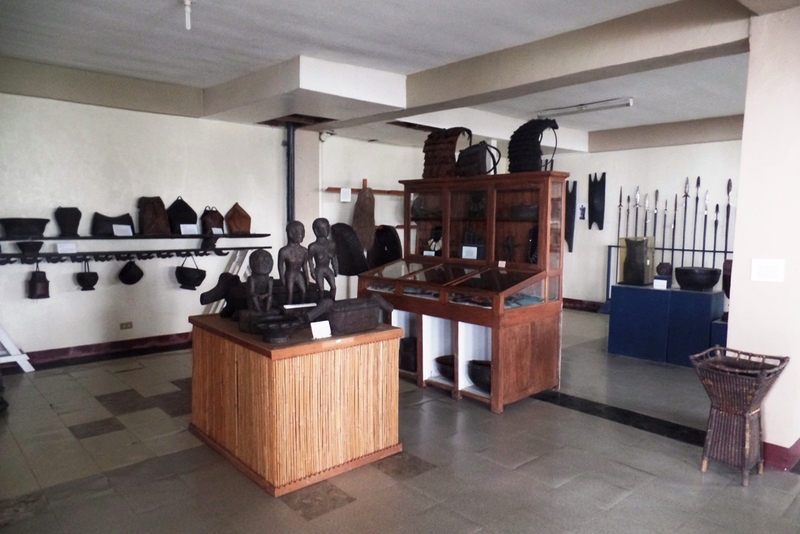 Such as the National Museum of the Filipino People which, through its four floors, houses various displays on natural history, indigenous tribes, sculpture, art, and had a large collection of artefacts excavated from the wreckage of the San Diego; a Spanish ship with sank offshore in the 16th century. 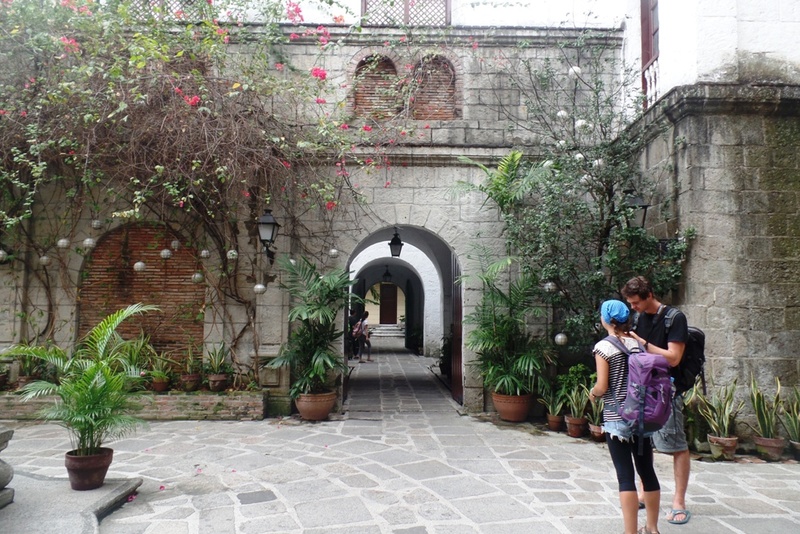 Casa Manila – a reconstruction of a Spanish colonial house, filled with many original antiques – was also a refreshing break from Manila’s noisy downtown, and it was near to the Cathedral and San Agustin Church, both of which were worth the time they took to have a quick browse. By the end of my two days spent wandering around its sights, although I still couldn’t call myself a fan of Manila, I did start to appreciate that it had some interesting and pleasant sights to see if you can bear passing through its more unsightly spots to reach them. To finish off our time there James, Chloe, Pedro, and myself had a wander around Manila’s vibrant Chinatown, where we stocked up on lots of tea and even found a decent vegetarian restaurant, before we catch a taxi to the bus station to catch a sleeper heading north. More photos from Manila can be found on my Flickr page. Leaving Sibuyan Island behind marked the end of our journey through the Visayas. Pedro, James, Chloe and I returned to Romblon Island for a day, so that we could catch the ferry cruising towards Masbate the next morning. 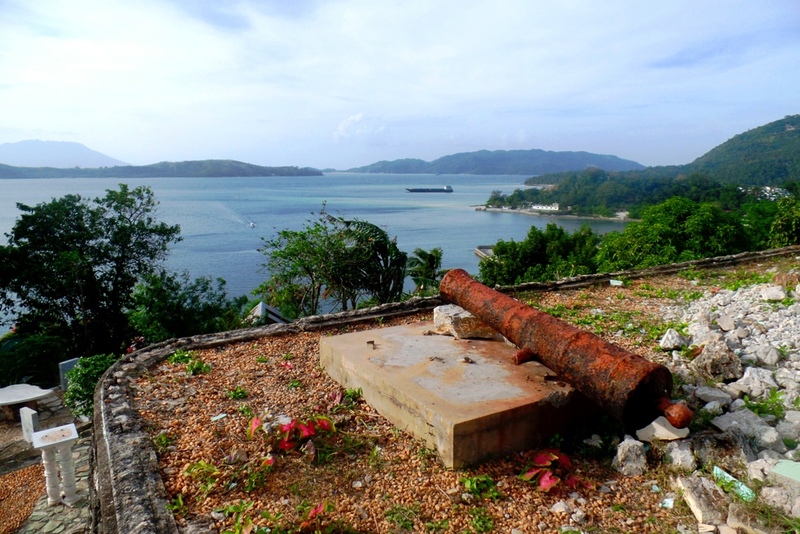 With a free afternoon to spare, on an island I was already familiar with and fond of, I decided to return to Fort San Andres – which had a great view of Romblon Town – and watch local life trickle by, while I wrote some ideas for a novel I am currently working on and drank a bottle of San Miguel. The ferry we caught the following morning was comfortable (we each had our own bunk bed), which was a huge blessing as the journey to Masbate was eight hours. When we arrived we discovered we had missed the last boat to Pilar, so it seemed we were destined to spend one more night in the Visayas before we reached the mainland. Masbate wasn’t without its charms, but it was busy, a little grimy, and, judging by the warnings some of the locals gave us, prolific for crime. There were some nearby attractions just outside of the town, but we had arrived there way too late to go out on a day trip, so we just claimed a room in the hotel near the pier and spent most of the afternoon relaxing in the lobby. We reached our destination – Donsol – the following morning and made our way over to the Visitor Center to book an activity which would prove to be one of our highlights from our entire time in the Philippines. 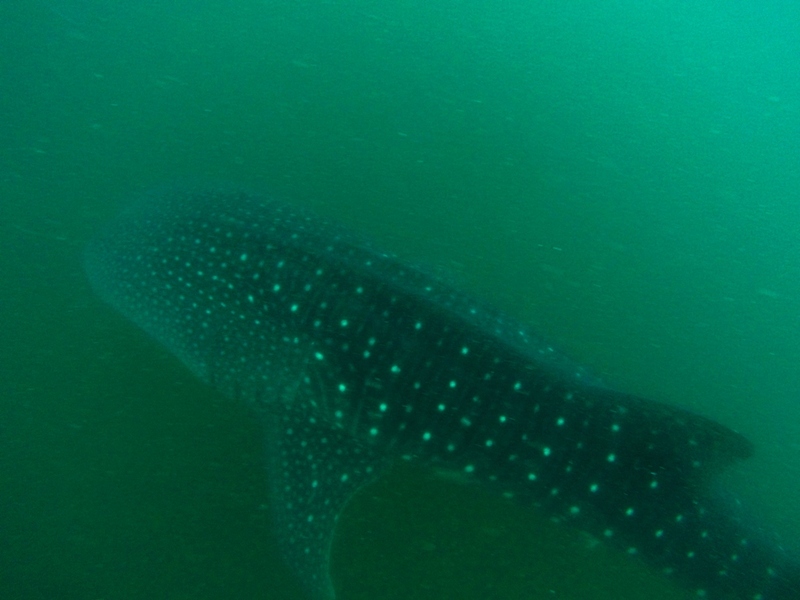 Donsol, due to the abundance of plankton and krill which are carried into its seas by the tropical currents, is a hotspot for whale shark spotting. 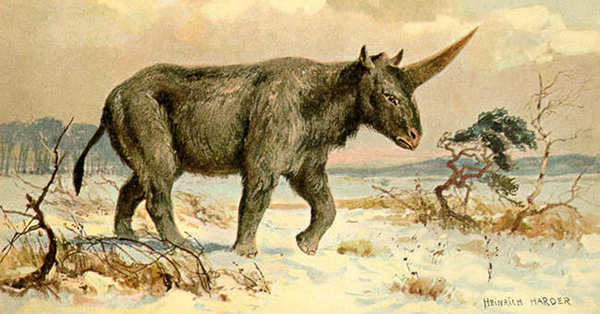 The locals have known about the prescience of the creatures – which they call butanding – for hundreds of years, but they always kept a wary distance from them, thinking them dangerous. In 1988 a team of scuba divers ‘discovered’ them and, shortly after that, Donsol became a world famous tourist destination. 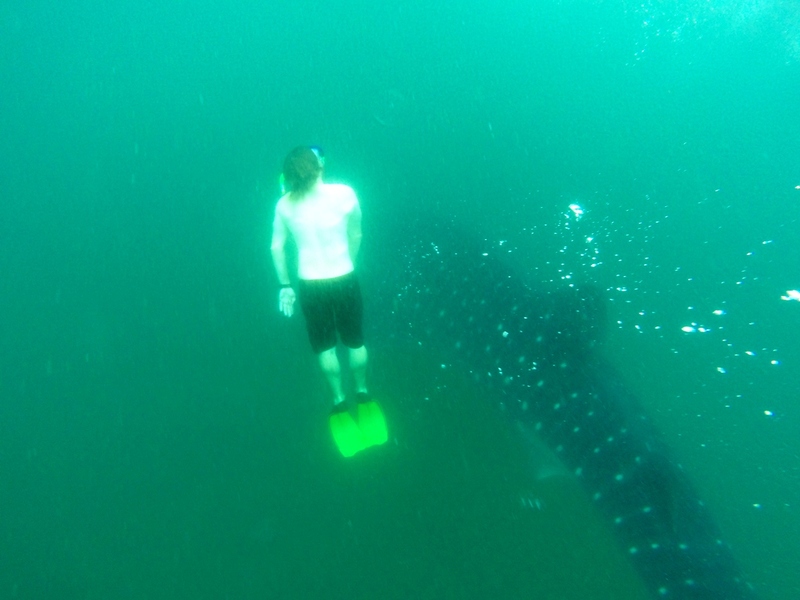 Because whale sharks are an endangered species all activities around Donsol’s coast are regulated by the local government. Only 25 boats are allowed out at a time, and each one is attended by a trained ‘BIO’ (Butanding Interaction Officer). 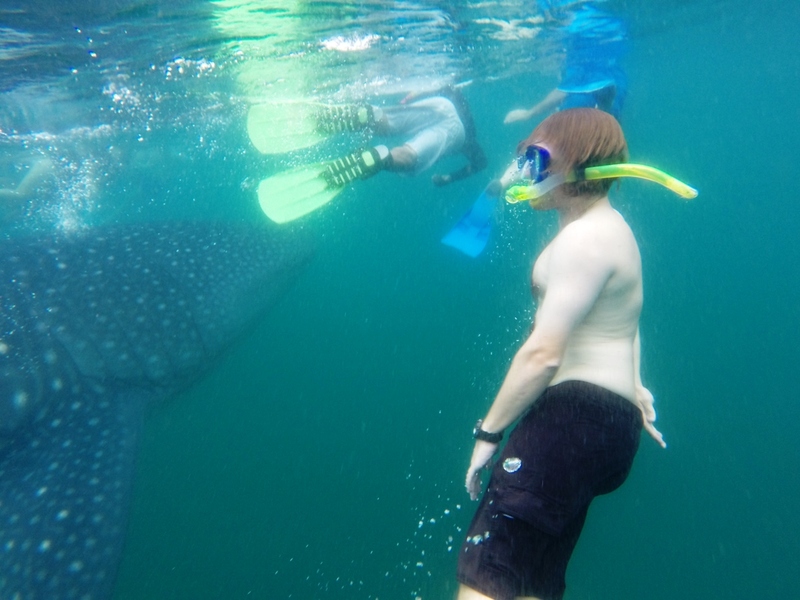 Before we were allowed in we first had to watch an introductory video and be instructed upon many rules – such as to not to touch the whale sharks and always maintain a distance of at least three meters from them, etc – and, once that was over, we were fitted for masks and fins. The following morning, we were taken out on a boat with our BIO, Jerry, and his crew of three. We didn’t have to wait for very long until one of the crew yelled something and Jerry told us to jump in so we could see our first whale shark. 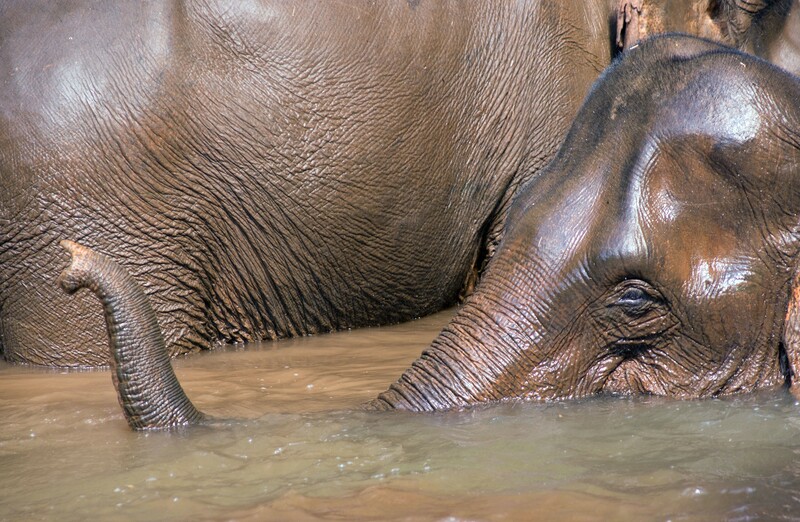 I plunged into the water and, as soon as I opened my eyes, saw one of them swimming straight towards me and had to twist out of its way. We followed it for about fifteen minutes, and then its path crossed with another – even bigger – whale shark, and we then followed that one for a while. In the space of three hours Jerry’s crew spotted six, in all, the biggest being ten meters long. 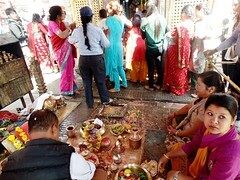 After it was over we went back to our guest house to shower and collect our bags. We were heading to the nearest city – Legazpi – so we could catch a night bus to Manila. Photos from this blog were donated to me by James, whose website can be found here.